My very own space! where I can express my inner desires and show off my photography. Another poor quality photo, shame on you (pocket camera). I took out my rebel camera the other day and started using it again. I will try to take good photos and promised to bring my food to life. 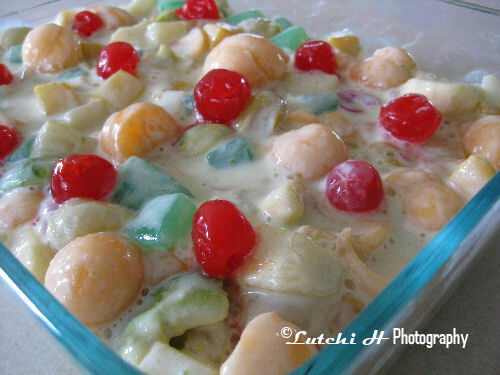 In a bowl, combine all the fruits, add nestle cream and condensed milk. Stir or fold gently and refrigerate until serving. 0 Comments On "Fruit Salad"
Please use this search engine to find something that you wish. Hello! Another place for me to show off my passion in photography and cooking. You will find anything and everything about food and foodnography. I am not an expert in both areas but I would love to share my experiences in the kitchen with my camera. Feel free to hang around and I hope you will enjoy your stay. I am open 24 hours so do not hesitate to drop me a line. © 2008 Photographs and Ranting and Blogger Templates .